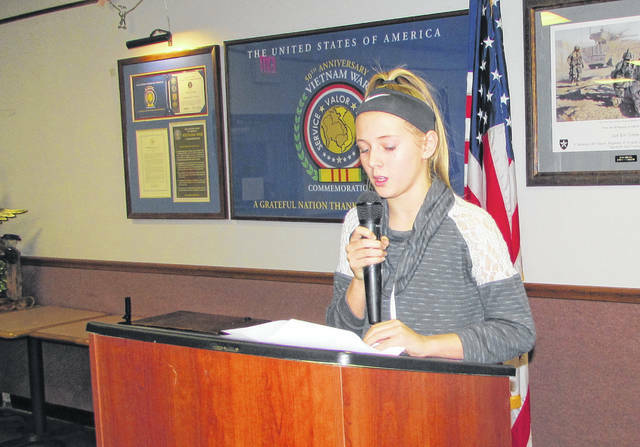 Brianna Hill, a seventh grader from Bright Local Schools, reads her essay during an awards presentation Friday night at VFW Post 9094 in Hillsboro. Hill’s essay of “Why I Honor the American Flag” won third place in the Patriot’s Pen competition sponsored by the VFW Auxiliary. Six young people from Highland County were given high honors Friday for their entries in the Hillsboro VFW Post 9094’s Voice of Democracy and Patriot’s Pen essay contests. Shirley Wilkin of the VFW post told The Times-Gazette that there were 138 participants in the two essay contests, with entries coming from Lynchburg-Clay, Hillsboro, Bright Local Schools and Hillsboro Christian School. She said the essays had to be between 300-400 words, with the theme “Why My Vote Matters” for the Voice of Democracy and “Why I Honor the American Flag” for the Patriot’s Pen. Students from Hillsboro Christian Academy received first, second and third place in the Voice of Democracy, which was geared toward students in grades nine through 12. First prize in the Voice of Democracy essay contest went to senior Ethan Hatfield; sophomore Kaitlyn Meadow-Woolum placed second; and freshman Patrick Hardy received the third place award. Hatfield’s winning essay described three reasons why it’s important to exercise the right to vote in this country. In the Patriot’s Pen, top honors for grades six through eight went to a pair of students from Bright Local Schools and one from Hillsboro Middle School. Taking first place in the competition was Cole Aliff, an eighth grader from Bright Local, second place honors went to Dalayna Collins, who is in the sixth grade at Hillsboro Middle School, and seventh grader Brianna Hill, also from Bright Local, placed third. Aliff’s winning essay about honoring the flag was personal and largely inspired by a family member he admires. United States Army and Korean War veteran George Stewart was Aliff’s great-grandfather, who he said was one of the founding fathers of the Hillsboro VFW post. The local winners received certificates and monetary awards in both competitions, with first place winning $100, second place $75 and third place receiving $50, courtesy of the VFW post. Lora Abernathy, assistant store manager for Kroger in Hillsboro, was one of the judges in the essay competition and said evaluating what the students wrote was a difficult undertaking. Wilkin said she was amazed at how inspiring it was to see strong patriotism in the younger generation and pride in both flag and country. “We don’t really give credit to these young people for their feelings and deep emotions concerning our country,” she said. The local entries were evaluated by a group of five judges at the local VFW post, with three winners chosen in both groups who were then forwarded to VFW Auxiliary District 4. Although none of the local entries went on to regional competition, she said District 4 covers several counties and is one of 12 districts in the state VFW auxiliary. The state VFW auxiliary chooses one finalist from the state level to progress to a national judging competition where scholarships and prize money are awarded. According to the VFW auxiliary, the national competition will take place March 2-6 in Washington, D.C.